The Miracle Machine essentially works like a Soda Stream by turning water, grape concentrate and yeast into wine via a mobile phone app supported by iOS and Android. A digital refractometer measures the sugar content of the wine during the fermentation process, while a ceramic air-diffuser pumps filtered air under a regulated micro-oxygenated environment in order to soften the tannins. At the same time, an ultrasonic transducer directly underneath the chamber resonates and speeds up the flavour development of the wine. Customers can choose the type of wine they want to make, from â€œNapaâ€ Cabernet Sauvignon and Chardonnay to â€œOregonâ€ Pinot Noir and a â€œTuscanâ€ red blend. 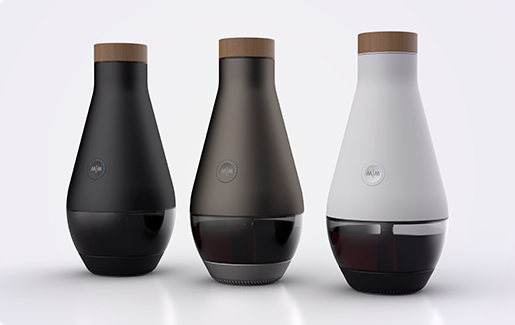 via Gadget invented that turns water into wine.